Celebrating Over 50 Years Rooted in Faith! 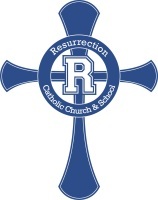 Resurrection currently offers three different Bible Studies to meet the needs of our parishioners. Come join us today and learn more about our faith and our Lord. What are the options for Bible Studies? Men’s and Women’s Bible Study: Intergenerational and gender based Bible study held throughout the year on Sunday mornings from 9:15 a.m. until 10:15 a.m. Material covered is from many different Scripture Series. Each session lasts approximately 6 weeks. Coffee and Bagels provided! Facilitated Bible Study: A facilitated Bible Study takes place each Wednesday in the Middle School Building, 7pm till 8:30pm. The studies look at different books of the Bible in their entirety. Commentary is provided; you only need to bring your bible. You should bring a bible, but if you don’t have one, don’t worry, we have one for you. Additional materials vary based on the study.